Kindle And Me...: My Life Next Door by Huntley Fitzpatrick. I know that in a review, 'I loved it!' is an over-used phrase but in this case, I really really did love it. 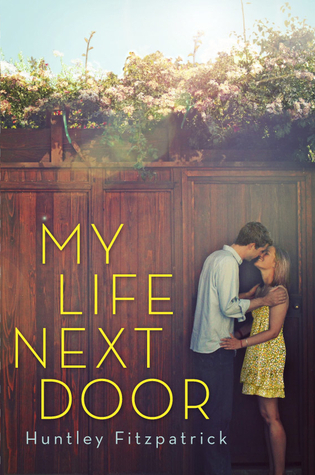 I added My Life Next Door to my my wishlist way back in November, 2011, that's how long I've wanted to read this book! Like most girls, I'm a sucker for YA Contemporary so its no surprise that I was dying to get my hands on this. I'm happy to say that I wasn't disappointed, in fact, I'm far from it. My Life Next Door swept me off my feet. Really. It's one of the rare novels that made me go through a whole range of emotions and had me rooting for all the characters, even the ones that seemed annoying on the surface. This novel tells the story of..well, a lot of people but it's told from the POV of Samantha Reed, a 17 year old girl who's raised by a single mother. All her life, Sam's followed the rules and tried her best to please her mother, which was pretty hard since her mother's one of the most judgmental people out there, but there was one thing Sam has kept from everyone, especially her mother - she watched the Garretts, all the time, for years. The Garretts were everything Sam's mother disapproved of - loud, messy and too many kids to count - and yet, they were the reasons Sam was fascinated by them. Most young adult contemporary novels are repetitive, especially with the 'boy-next-door' romance but there wasn't a single cliche moment in My Life Next Door. Huntley Fitzpatrick has the amazing ability to create wonderful, vivid, realistic and lovable characters. Sam's different from most protagonists - she's strong, calm and sure. I think this is probably the first time I'm attached to all the characters mentioned in a novel. The Garretts are amazing, especially George! I guess it goes unsaid that Jase is absolutely drool-worthy and so is Tim,in his own bad boy way. The best part for me were the scenes between Sam and Jase, I got butterflies watching them fall in love, especially during certain toe-curling moments. The fantastic characters and the wonderful writing are what drive this book. The novel's filled with believable characters and every reader would be able to relate to at least one of them. There were so many quote-worthy sentences, which I always look for in a book! Everything about My Life Next Door was unique and I absolutely can't wait to read more books by Huntley Fitzpatrick. I just heard about this book a little while ago, but I've been dying to read it since then. And now after reading your review and seeing how much you loved it. It's making me want to read it even more! I want to read this one SO badly. I wish Dial was on Netgalley. Love the cover, love the title, even love your review ... I just can't wait! I wasn't big fan of Anna and the French Kiss. Would you still recommend it to me, Angana? I've been debating whether or not to pick this up for quite a bit now. I agree with you, this book is amazing!